At least it’s easy to see the difference between stalactites and stalagmites, which are also called dripstone. When water flows down through the ground and into a cave, it dissolves a mineral called calcite (a major building block of limestone) and carries it through cracks in the ceiling. The dripping water leaves behind traces of calcite, which slowly builds up on the ceiling until a stalactite takes shape, hanging down like an icicle. Water from the end of the stalactite leaves more calcite in a pile on the cave floor, and pretty soon a cone-like stalagmite forms. That’s why stalactites and stalagmites are usually found in pairs. Sometimes they grow together to form a pillar or column. Another word for mineral deposits created in caves by the movement of water is “speleothem,” and there are other types of speleothems besides stalactites and stalagmites. For example, “boxwork” is made of thin sheets of calcite that form (duh) boxes, and a “stegamite” is a ridge of calcite that pushes upward from a cave floor. A “straw” is a special kind of stalactite that is long, tube-like, hollow, and super thin — around a half-inch or less in diameter. Limestone caves full of stalactites and stalagmites are popular tourist attractions in a lot of places around the world. 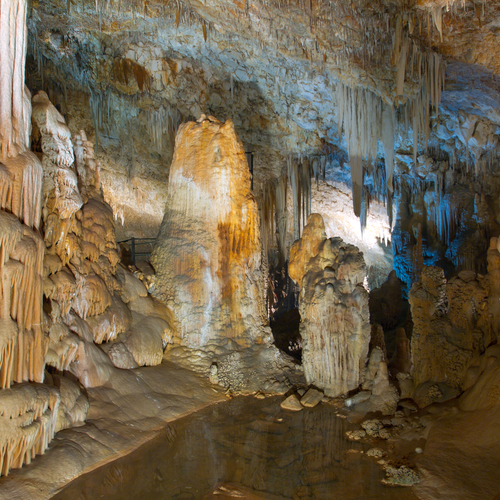 Some of the more famous ones are Carlsbad Caverns in New Mexico, Buchan Caves in Australia, and the Jeita Grotto in Lebanon, home of the world’s largest known stalactite.